If you're involved at all in the horse world, chances are you've heard of Alex Brown. If you haven't, he is and was a web master (for the internet - it's not a fancy riding term! ), and also an exercise rider for such big race trainers as Tim Wooley and Steve Asmussen. 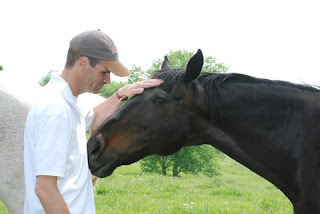 He's also the man behind the site linked above, Alex Brown Racing - which has become a community, resource, and information site for not only fans of Barbaro, but all people opposed to horse slaughter. Who is Barbaro? He was a phenomenal race horse whose life ended too early. He won the Kentucky Derby in 2006, and was injured in the Preakness. He survived the surgery to repair his leg, but sadly succumbed to laminitis while he was healing. Everyone thought that Barbaro was the Secretariat of this generation, and that a Triple Crown winner would finally exist after almost 30 years. 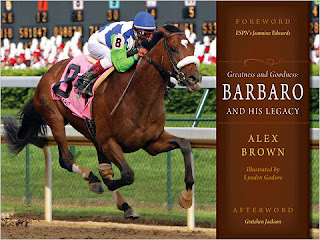 Alex had a chance to spend time with Barbaro while he was healing, and decided to write a book about Barbaro, what made him great, and what made him inspirational. Alex came up to our neck of the woods last week to do a talk at the North Salem Library. Unbeknownst to us, he chose to donate $10 of every book sale to Akindale. 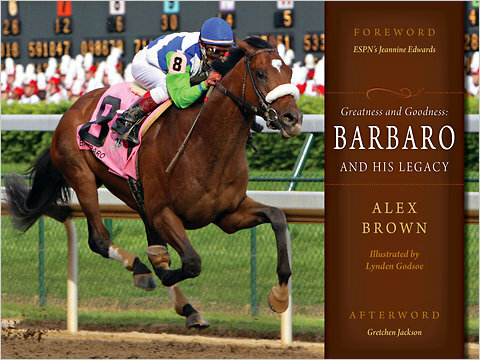 I can tell you that not every author has a way with an audience, but Alex kept everyone interested and engaged with his personal anecdotes as well as what he learned from the people closest to Barbaro. I haven't delved very deep into the book yet (he signed the book to Matt, and it now resides on his night stand, so I may have to wait in line! ), what I have read has been wonderful. Interesting, exciting, and the illustrations and photographs are second to none. A lot of heart went into this book, and it would be a fantastic addition to your collection, whether you're a horseperson or not. Want to buy one for yourself or as a gift? Click here. The next day, Alex came up with Akindale Super Volunteer Stephanie and had a tour of the farm with she and Erin. It was a pleasure and an honor to have Alex come to visit Akindale, and we're really grateful for his generous donation based on his book sales. Hopefully through Barbaro's legacy, we can continue to work together to improve the welfare of all horses. There are actually some chocolate chip cookies sitting in my kitchen. It was a real struggle to choose yogurt over cookies for breakfast this morning. The cookies I'm talking about today don't have any calories though, and won't add to your waistline. They will, however, add panache, polish, and bring joy to your day. I'm talking about the latest Cookie Lee Jewelry! Let's face it. We're all tightening the grip on our wallets, and luxuries, shopping sprees, and outings to the mall are becoming things of the past. But by adding a few statement pieces, you can dress up the wardrobe you already have without breaking the budget. Gifts for friends? Consider it taken care of. At these prices, you'll love the bang for your buck, and your friends will love you for giving them something so chic! It's super easy to pick out a few items for yourself or for gifts. All you do is click here, head to my site, and off you go! You can shop directly from my web page, or you can get in touch with me directly and let me know what items you'd like. Credit cards are a-ok! Just because I can't help myself, here are a few pieces I just love! The Turquoise Strands Necklace is absolutely perfect. Pair it with a white or black top and you're ready to run errands or out for cocktails. Added bonus: You can wear this necklace seven ways. Seven ways! Yes, I thought that should be repeated. If you're going with the Turquoise Strands, finish the look off with the Turquoise Cabochon Ring. What a gorgeous pop of color, no? I love this necklace, too. It's called the Pure Blush Necklace, and it can also be worn several ways. The palest of pinks just reminds me of the peonies in my wedding bouquet, and it adds a softened polish to whatever you're wearing. The Floating Crystal Earrings below are so simple that I can't keep my eyes off them, and I can't recall if I've ordered a pair for myself or not. If not, I'm going to - like, today. They go with everything and are just so clean and fresh. If you're more into earth tones, the Sea Vibe Bracelets (necklace also available!) are a great addition to your wardrobe. I love that these aren't big or clunky (I can't deal with things knocking around on my arms), and these are light. Every time I wear them, someone notices them. If you see me around horses, you'll see me in these Antique Elegance Hoop earrings. I love them. Love them! (Why do I repeat things when I'm talking about jewelry?) I'm all about an antique look, and these do just that, and yet they won't get in the way while wearing a helmet. These are fabulous every day earrings that just give you a hint of glitz. To go with the earrings, the Eternity Links Necklace is where it's at. Not too big (so it won't distract me while riding) but totally adjustable, so it can lie close to your neck or convert to a longer necklace. Last but not least, I'm a sucker for fun, dangly earrings. I'm totally wearing these Luminous Jet Earrings for a night out. Soon. So take a look (if you didn't see the link the first two times, look out, here it is again! ), and grab a little something special for yourself or someone you love. In all honesty, any sale helps us, and helps our horses - whether it's a lesson or schooling session for Zeus and I, or the prescription medication that Topaz needs for her Cushings Disease. I'm lucky that fun, gorgeous jewelry that lasts plays a part in keeping our dreams at TMF alive! I am ridiculously proud of Zeus! Today we went to Frazier Farm in Woodbury, CT. I trained at Frazier years ago. We're talking decades - when I was just starting out in Eventing with Beau, my very first horse, and then Midnight. Frazier is wonderful because it's a casual, friendly, supportive atmosphere, and has a plethora of inviting lower level jumps. Perfect to get a youngster like Zeus started on cross country. Although we didn't get much film, I can tell you that Zeus did famously, and went over every single thing I put him in front of. He saw a jump ahead of us, his ears would perk up and he would just light up. He *loves* his new job. As we were jumping some other things around a field, I happened to see a bank. But it was a double bank - double imposing, and double the difficulty. Zeus has never done a bank, not even a tiny one. Since things were going so well, I thought, "Hmm. I wonder what he'll make of this." He ate it up. And then some! A quick video below, of the Grotto (a close of trees, going down into a little dark valley, over a log, and then back out again). It's pretty intimidating for a young horse, especially one who hasn't done anything like it before. Then we turn to the bank. You can hear me in the video (link here), and you can hear Mom, always my cross country advisor, saying, "Very good!" She also said to me later that if I do this right - take our time, lots of schooling and encouragement - he'll be unstoppable. Unstoppable. I like the sound of that. The deluge of rain the past few days has finally ended. I think. I'm still watching the radar like a hawk, as I hear distant rumbles of thunder. Thunder is ok, but we cannot handle another drop of rain! The past few days, I've taken Zeus out on a new road - Weil Road. It's a gorgeous dirt road with few houses, no crazy dogs running out to get you, and a lovely lake that borders the road on both sides at one point. Zeus and I had gone out solo a few times and he'd done so well, trotting, cantering, and walking home calmly after our adventures. This map gives you some idea of the layout. What are the icons on there? You'll find out. Meanwhile, the star...is our house! Yesterday, I convinced Matt to join me out on trail, just for fun and because it would do us all good to get out for a bit and enjoy the lull in the rain. He agreed, we tacked up the boys, and off we went! It all started innocently enough. There we were, strolling down the dirt lane, had a nice little trot up a hill, and we were coming up on the best part - the lake views! I was so excited, I brought my cell phone along to take a photo, which was the original plan for this blog entry. We should all know by now that those original ideas have a way of flying out the window when those boys Zeus and Siggy are involved. Sounds like an adventure, right? We're not done yet. Matt happened to fall right in front of Zeus, and because we can't do anything in a calm manner, Siggy thought it would be a great time to hightail it down the road, back towards home! So he's off, stirrups flapping in the breeze, around the corner and out of sight. Don't forget about Matt still on the ground, totally fine, but still....you don't really want to be there. In front of Zeus. When his partner in crime just ran off into the sunset without him. It's in those moments of insane panic when my mind goes absolutely quiet and my instincts take over. I gave Zeus his head, and he leaped right over Matt. If I'd pulled on him, there was a chance he could have hung a leg and stepped on him, and I had visions of Matt on the dirt road with a hoofprint in his abdomen if I messed this one up. Matt and I locked eyes while Zeus and I were in midair, and his face of wonder and shock will be stuck in my head for a long time! Ok, Matt didn't look like that while we jumped over him, but you get the point. Moreover, what on Earth are these guys thinking!? As soon as we cleared him, Zeus was off, like we were back at the races. I was able to slow him enough to look back and see Matt not only up, but jogging after me. I bellowed, "Don't run! I'll get Siggy!" and off we went at breakneck speed. We finally caught up to him about halfway back, and he hung a right into someone's driveway. I corralled him with Zeus just as Matt came around the corner on foot. I thought, "Whew!" Siggy, not so much. He saw Matt coming, faked left, went right, and zoomed back out onto the road again, bucking and having a marvelous time playing this new game! We were off again after him, and caught up not long after, where he veered off into yet another driveway (and here I am, praying he doesn't poop on anyone's lawn or create any divots). Zeus had tired of this game and was anxious to just walk home with his buddy or open up and really boogie, neither of which were happening. After a few moments of "You can't catch me!" 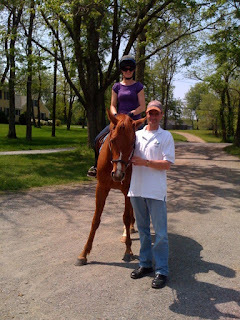 from Siggy, Matt and I finally smushed him in a corner of the property and Matt was able to get ahold of the reins. 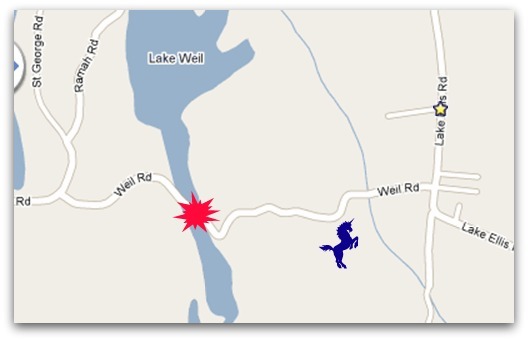 The unicorn icon in the map above is where we finally caught the equine fugitive. 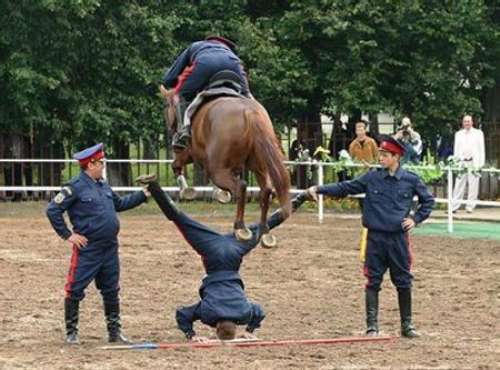 Sorry, I couldn't find a riderless horse anywhere. We trudged home (except Zeus, who pranced), and then Matt thought he might need to be looked at by a doctor. I got this photo a little later in the day. JUST KIDDING MOM and POP DiCO! My brave, humorous husband is a little sore today, but he handled his first fall from a horse with ease and his usual casual remarks, like, "At least I know how to fall." He wandered around the house yesterday saying, "I fell off a horse today. 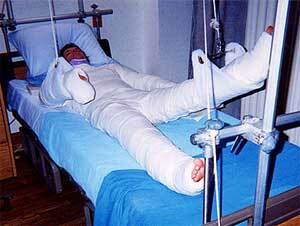 I fell off a horse today." He was trying out how it sounded. I thought he might be a little apprehensive to get back on after all that. A mere 4 hours later, he was looking in a local paper and said, "Oh, here's a hunter pace about 30 minutes away on June 5th. I'll ride in it!" Last Friday night started out as your typical, run-of-the-mill start to the weekend. I'd fed the horses dinner, Mojo caught up with me on my way to the house from the barn, and we wandered into the basement together, where I could take off my boots and coat, and Mojo could have his own dinner. Neither one of us ever expected what would follow. Nor did Matt, who was on the train on his way home from NYC. The frantic text I sent him elicited the response, "Oh, this should be good." Just as I was closing the basement door, both Mojo and I heard a "flap flap flap!" coming from above the washer. We both stared at the ceiling, wondering what that noise could possibly be. After another few "flap!" noises, a tiny little sparrow dropped out of the insulation in the ceiling and onto the overhead light. I thought, "How on Earth did a bird get in the basement?!" I opened up the basement door and began the process of shooing the sparrow back outside. Here's the thing. We have a really. Big. Basement. 10 minutes later, Birdie was back over the washing machine again. So was Mojo, who had scaled the shelving next to the washer. Amidst my screams of horror, Mojo chased Birdie into the ceiling, and came back out of the ceiling....with Birdie in his mouth. Well, you have to admit, he's very handy sometimes. One more ear piercing scream from me convinced Mojo to let go of Birdie, spitting him out. Birdie flopped from the top shelf to the teeny nook behind the washing machine. There's my assistant, still with feathers in his mouth, planning his attack to get his Friday Night Appetizer. I used my handy camera to check a) where Birdie was and b) if Birdie was still alive. He's upright! And, he's tucked way back there. How would I get him out of there?! I kicked Mojo out of the basement much to his dismay, and then I went upstairs for reinforcements. A big, crisp glass of wine. The wine and I went back down to the basement, ready to take on the next task at hand. Moving the washing machine. It says it's heavy duty. It's just plain heavy. Despite my attempts, I couldn't get Birdie out from behind the washing machine. So the wine and I went back upstairs, to see if he'd hop out on his own, or Matt got home to help me fish him out, whichever came first. 15 minutes later, I went back downstairs, and saw a little brown creature hop past me and towards the water buckets. He was out! He decided it would be fun to get back at Mojo for trying to eat him, and promptly went to go poop in Mojo's food bowl. I kid you not. The next 10 minutes involved me chasing Birdie back and forth in front of the open basement door, encouraging him to go back outside. "Go towards the sounds of nature!" I said. Hop, hop, chirp, hop hop....back and forth. Just as I was about to go upstairs for more wine, he seemed to notice the door was open. And so he hopped out into the evening air, as if he were on an evening stroll, stargazing. I knew Mojo had to be nearby - Birdie would have to get to flying, and fast. So I chased him around the driveway (with, yes, wine in hand, it was Happy Hour, after all! ), and eventually, he took off, to the top of the tree that shades our covered porch. Matt was just so disappointed that he missed all the excitement. He was not excited at having to move the washing machine back into place. But hey, it's just another wild Friday night at TMF. My friend Katie Murphy, an eventing buddy from the days of Young Rider camp, said it very well on Facebook the other day. Over the past few weeks, Zeus and I have been very slowly starting over jumps for the year (if you remember, last year we were doing crossrails and very small verticals). Part of his future career as an event horse involves him having enough courage and trust in me to pretty much jump over anything I put in front of him, no matter how weird or scary it looks. And some event courses are pretty scary, especially as you advance up the levels. But, if you go slowly and grow your horse's confidence, well....they learn that they can pretty much do anything. Zeus is well on his way. We went back to our town park, which has a great ring and lovely mowed riding/ hiking trails, just for citizens of our town. I *love* that. When I was walking through there a few weeks ago (before bringing Zeus for the first time), I noticed with an insane amount of delight that there are, in fact, some cross country jumps through these trails! Nothing much - some telephone poles, some barrels, a very scary jump made with tires and some coops, but it's enough to practice and give a safe, fun introduction to cross country to a young horse like him. In addition, our park boasts a gorgeous riding ring, built in 1965. There are a few jumps in there too, though I have a feeling they were also built in 1965. Still, they're usable and I'll take whatever I can get! Here we are in the riding ring, just jumping around with two jumps I put together a few days before. Part of Zeus' training also involves his ability to focus when he's in a new place and also the only horse in the area. The first time we brought him, well, he wasn't happy to be a solo act. But now, he's settling in and understanding that all the grass you see behind us....well, he's the only one who gets to eat it. Now when we go to leave, he looks at us as if to say, "What? And leave alllll this grass behind?!" Then I decided to just stroll around up through the trails, and hop over the mini jump I'd found. I was delighted that Zeus took it upon himself to accelerate and leap over it, really enjoying himself! Since that went so well, I decided to challenge him a bit further and handle a higher, more solid jump. Again, he almost looked at it with glee and just took me right to the jump, placing himself perfectly and nearly doing his own victory lap afterward! I was ready to leave it at that, pack him up and take him home, after a job well done. Zeus decided he wasn't done yet. A quite scary looking tire jump loomed ahead of us, and the last time I walked him past it, he gave it a wide berth, as if the tires wanted to eat him. This time, he looked at it like, "Woohoo, what are we waiting for?!" I said, "Ooook!" What a brave boy. I can't wait to see what else he loves to jump. Tires today....the sky's the limit tomorrow. On Wednesday, due to the rain I had an unplanned day off. I decided it was high time to get moving on creating some more challenging jumps than what we already had, so off we went to Home Depot, to get the creative juices flowing. Time for some Arts & Crafts! When we got back, armed with spray paint, regular paint, and visions of Zeus sailing effortlessly through the air, I got to work! Today, a bunch of my painted jump poles (landscape timbers according to Home Dept, $3.97 apiece) made their way to the ring for us to begin working with. Zeus loved how some of them came in our colors. Actually, that color is the exact same blue as our dining room. What a coincidence! Nah, not really. It's the leftover paint from our dining room. This next one I am really very proud of. A plastic garden lattice, $12.99 at Home Depot, with some newly painted jump poles (Lime green, my mom's favorite color - henceforth known as the Mom Lattice Jump), makes for a challenge to a youngster. It looks weird, it's semi-solid, and he could easily choose to not jump it. However, with Zeus' enthusiasm, I somehow think he'll be able to manage this. We did the blue poles on the ground today, and Zeus sailed over them without a care in the world. So now it's on to incorporating those poles into a new-ish looking jump. It's 2'3'' at this height, and he'll be jumping about 3+ inches higher within 2 weeks. While I brought in the poles and figured out where the jumps were going to go in the ring, Zeus would wander by, check everything out, and go back to his grass. You'll notice he's in a suit of armor against the bugs - he loves his fly mask and fly sheet! Tune in soon to see what happens. Hopefully, a jump or two might be caught on camera! As promised, I'm putting a bunch of vegetarian recipes that people sent me. In a huge twist of irony, we are having steak tonight. I know. I'm a horrible person. But it's so rare that we treat ourselves, and that I consider a very rare treat. The first two recipes are from reader Renee, huge Akindale supporter and a lovely lady I've come to know! Combine everything in a dutch oven and bake at 350 for 2 hours. From Renee..."Next one I've made over and over and over....LOVE it." I think I'm going to love it too! Bring a medium pot of salted water to a boil. Add the orzo and cook until tender, about 8 minutes. Drain and rinse under cold running water. Drain well. Thank you, Renee! Next up is from BFF Bexy, reporting in from London. Her first recipe I made not once but twice (because I had tons of arugula!). Even Matt thought it was satisfying, which is saying a lot. Bring a large pot of salted water to a boil over high heat. Add linguine and cook until al dente, stirring frequently, about 8 mins. Drain, reserving 1 cup of the cooking liquid. Immediately toss the hot pasta in a large bowl with the butter to coat. While tossing the linguine, gradually sprinkle the cheese, pepper, and enough of the reserved cooking liquid evenly over the pasta to moisten. Add the arugula, toss to combine, and season to taste with salt. This one just sounds SO YUM. I haven't tried it yet, but don't worry. Cheese and me - we're close. 1 pound cavatappi, very spiraled textured pasta that the cheese sticks to brilliantly! Drizzle oil into large pot of boiling salted water. Add pasta and cook according to directions on package, 6-8 minutes. Drain well. Meanwhile heat the milk in a small saucepan but don't boil! Melt 6 Tbsp butter in a large pot and add the flour (making a roux). Cook over low heat for 2 mins, stirring with a whisk. While whisking, add the hot milk and cook for another minute or two, until thickened and smooth. Off the heat add the two cheeses, the salt, pepper and nutmeg. Add the cooked cavatappi and stir well. Pour into a 3-quart baking dish. Slice the tomatoes and arrange on top. Melt the remaining 2 Tbsp of butter, combine them with the fresh bread crumbs, and sprinkle over the top. Bake 30-35 minutes until the sauce is bubbling and the macaroni is browner on top. And for the final recipes, from Lizzie, who has taken to Cuban cooking like a duck to water, or me to cake. Her husband is Cuban, and she's a fantastic cook - anything she's made that I've eaten has been delish. I love how specific she gets even though she doesn't really measure anything (I am guilty of that too!). Note for KC: make sure you use a mild chili powder, unless you've decided to like spicy food! Using a stock pot, saute garlic and onions in oil until mostly softened. Add peppers (including jalapenos if using) and soften. Add majority of cumin and chili powder, stir well. Add can of beans and can of tomatoes, simmer until desired consistency, adding water if necessary. Salt and Pepper to taste. For thicker chili, add tomato paste or some over cooked beans or potatoes. Adding tomato paste can take away chili flavor, so taste and consider adding more chili powder or cumin. If using meat, you can either brown first and drain before adding the garlic and onions to soften, OR cook separately with desired spices, extra garlic, and extra onions to be combined at the end (this is what I do since I like chili with no meat, and husband likes it with meat). All ingredients are flexible, up quantities as desired. I tend to cook in large batches and usually use 2 or 3 cans of beans and a red pepper in addition to the green bell pepper. If you make this in a crock pot, I recommend softening onions and peppers first... I tried once but didn't soften first and ended up with crunchy vegetable chili, which was weird. Leftovers make decent burritos! And a 2nd, totally different meat optional recipe: One of my favorite summer lunchtime or side dishes, though possibly not the lowest fat option, is SUPER DUPER EASY! Once in a while I'll mix in a can of tuna or shredded chicken, or leftover already prepared tuna or chicken salad (onions, celery, mayo and all) - so there's the optional meat! This was awesome! I now have a bunch of delish recipes to try, and you do too! Special thanks to Lizzie, Renee and Bexy for offering up recipes to post on here. If you decide to try anything, let me know what you think!